Whilst all the attention may be focused around the visiting riders and the Sunflower Trophy Race, there is still plenty of action to be had from amongst our local lads, who are aiming to wrap up their 2018 campaign on a high . In the inaurgrural USBK Superbike championship, the battle for third place has intensified after the penultimate round at St Angeleo, where Fermanagh rider, Aaron Armstrong closed the gap on Banbridge rider, Ryan Gibson, amazingly, both these riders, being Suzuki mounted! 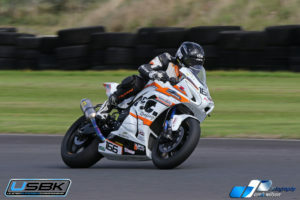 This year, Gibson, the 2016 Ulster 600 Cup Champion, now riding under the banner of JMcC Roofing, on the bright Orange/Black/White liveried machine has put in some very impressive results behind the dominating Gerard Kinghan and Ali Kirk. The 34 year old Car Salesman and mechanic is only in his third season of racing bikes, took in an early meeting at Donington, where the bemsee club held their opening race of the season, Gibson came home with a second place and a fastest lap, which no doubt was an encouraging start to the season. 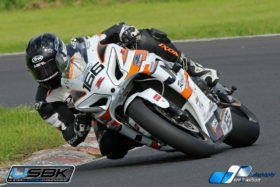 Back home, Ryans lap times have been improving at each outing, which is a personal goal he sets for each outing. 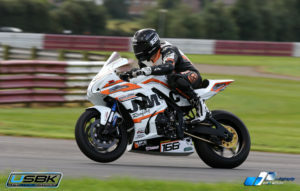 The Banbridge rider also made his road debut at the Ulster Grand Prix, where he finished 14th in the 600 race on Thursday evening. Paddock will be open from 2.00pm!